Florida Gulf Coast University Sr. Sharonda Pickering holds the ASUN Conference trophy after helping her Eagles team to its first Conference title since 2012. The Eagles went on to win the ASUN Conference Tournament crown for the first time in program history, earning the right to play in the NCAA Volleyball Tournament. Sharonda Pickering became the territory first freshman volleyball player to compete in the National Jr. 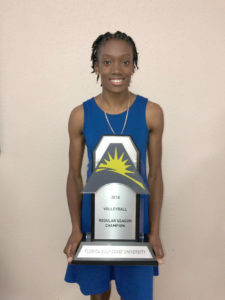 Colleges Athletics Association Volleyball Tournament and the first senior to play in the NCAA Volleyball Tournament, after helping the Florida Gulf Coast University Eagles to its first ASUN Conference Tournament title in program history on November 18. The Eagles used a thrilling five set 27-25-25-20, 22-25, 17-25 and 15-12 victory over hosts and defending champions Kennesaw State, who beat them last year, to earn the automatic bid to the NCAA Tournament. They finished the season with a 26-6 record—including a 15 game winning streak—matching its 2012 and 2016 teams records. Pickering had a key block among her five and nine kills, that helped repel the Kennesaw Owls, during a key moment of the game. The Eagles faced the University of Central Florida on Nov 29, in the first round of the NCAA Tournament.